I love to travel and visit new places, but the hardest thing about visiting someplace I’ve never been is where to stay. You know how it is. You see all these places online but being unfamiliar with the area you have no idea if you’ll be close to the attractions or not. And besides, how long ago were those pictures taken? Does the place still look like that? Unless you have a recommendation from someone you trust, booking those reservations often feels like a shot in the dark. Never having been to the Village of Ruidoso, New Mexico, I was kind of feeling the same way. Several places came up in my search and they all looked wonderful, but I’m so glad I chose the MCM Elegante Lodge and Resort for our Girl’s Getaway! From the moment we walked in I knew this was going to be an amazing vacation! 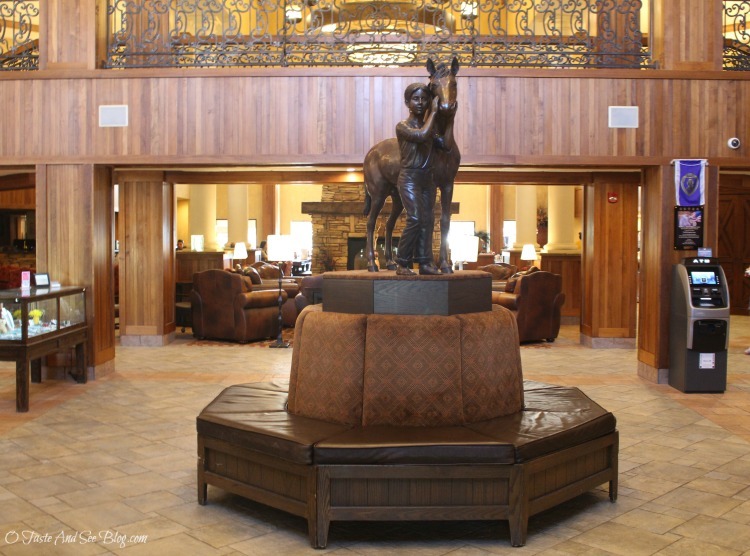 The lobby was beautifully decorated, warm and welcoming. Who doesn’t love a giant fireplace?! We made our way up to our room and found we were in the Hearts Wide Open Suite. It was a beautiful one bedroom suite with living room, complete with gas fireplace. We Texans love a good fireplace… since we rarely have a chance to use them here, ESPECIALLY in July! When I saw this kitchen, it made we want to do some cooking in the room, but there were so many wonderful places to eat, I didn’t. The bathroom was HUGE, including a Jacuzzi tub! And if that weren’t enough… there was an extra dressing area with separate sink and mirror! Perfect for a couple of fairly “high-maintenance” ladies on a girl’s getaway. The bed was so comfy! Usually I don’t sleep great my first night in a new place. But not here! Even in the most comfortable of beds, I’m a bit of an early-riser. Each morning I enjoyed sitting in the living room, sipping coffee, looking out the balcony door at the mountain. I could have spent all morning in the room but the hot breakfast buffet and made to order omelettes were calling my name! The omelettes looked amazing, but my favorite breakfast is good ‘ol bacon, biscuits and sunny side up eggs. When I saw bacon on the buffet I knew I just had to ask. The chef was more than willing to make me a couple of sunny side up eggs! Sometimes it’s the little things in life that make us the happiest! After breakfast it was time to explore. The MCM Elegante is so conveniently located that no matter where we decided to go, it was close by. Everything was within about a ten minute drive. 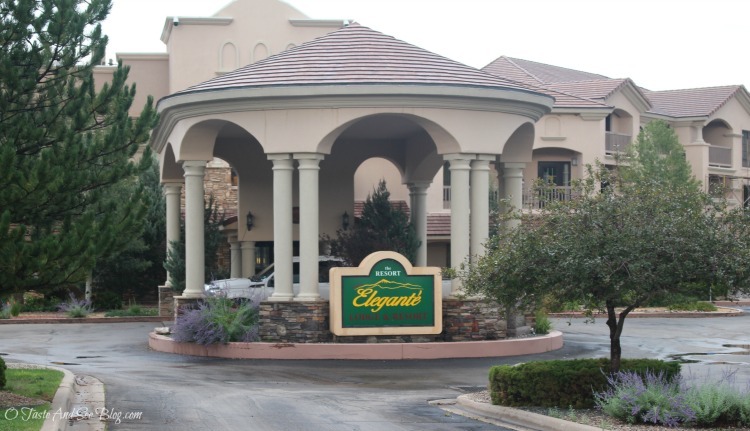 I’m not a golfer, but if I were the course at the Elegante would be yet another reason to stay. Even if you don’t golf, the rolling hills of the course are lovely. If you’re like me and want to skip hitting the golf ball and just go for a nice walk, you can do that, too! Right outside the hotel is a walking trail. It’s a nice paved path that circles the golf course and you never know what you might see along the way. 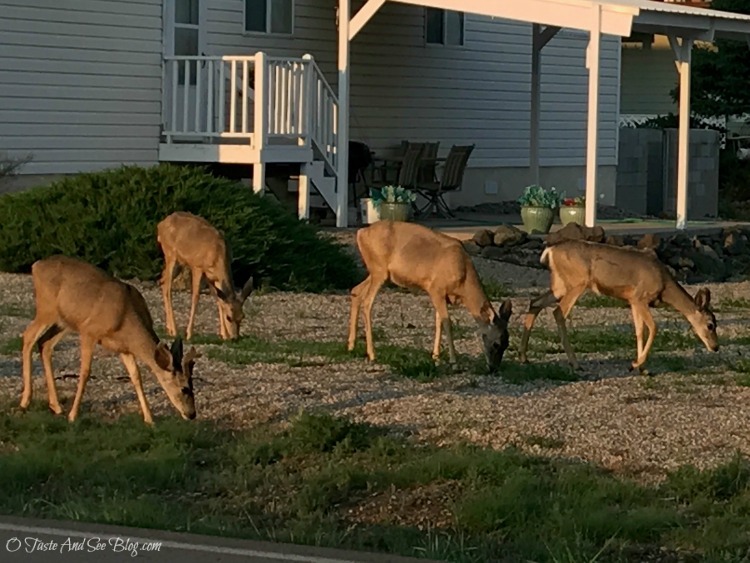 These deer (at least 6 of them) were just having a little dinner in the front yard of this house right by the road and our walking trail. So cool! Last but not least, the staff was super helpful and very friendly. They had great suggestions on things to do and even encouraged us to take, what we had been told, was the “white-knuckle” drive to the top of Sierra Blanca. I’m so glad we did! It was awesome and we even saw elk on the way up! And no white-knuckles…at least not for me. After an adventurous day, relaxing on the hotel’s back patio in front of the fireplace is a great way to unwind! If you’ve got kids it would be the perfect place to make S’mores! Quiet, peaceful, comfortable and convenient…. what more could you ask for? So, now if you’re planning a visit to the Village of Ruidoso, your hotel stay won’t be a “shot in the dark”. I highly recommend the MCM Elegante Resort and Lodge…. you won’t be disappointed! Loved this place! So relaxing and the location was perfect!!! I couldn’t have imagined it being any better!! !